What do you want to be known for? What’s your current reputation and what is your desired reputation? Are they the same? You can actively work towards developing the reputation you want – the reputation that can lead you to the opportunities you need to move your career forward. Think of your reputation as your personal brand and think of yourself as the manager of your personal brand. Your job is to create, communicate, monitor, and refine your reputation. People make important decisions about you based on your reputation – decisions like whether they want to hire you, work with you, mentor you, or promote you – so isn’t it worth the effort to develop the reputation you want? You can leave your personal brand to chance or you can be thoughtful, proactive, and intentional about it. Take steps now to actively manage your reputation. Develop and refine your personal brand. Your personal brand must be authentic. It must reflect who you truly are – your strengths, interests, and values. Start by making a list of these attributes. Think about what makes you uniquely you – what differentiates you from everyone else. What can you do better, faster, or more effectively than others? What unique voice do you bring to your organization, clients or customers? Try to write down as many attributes as you can, without editing. Think about any parts of you that are in process – perhaps you’re working on your public speaking skills or your leadership skills. Add these attributes to your list, even if they are not yet fully honed. Think about your short-term and long-term goals. Consider the attributes on your list that will help you achieve these goals. Now, narrow your brand attributes to the 3-5 most significant items. Are these the things you want to be known for? If not, continue to refine the list until your personal brand resonates with you. 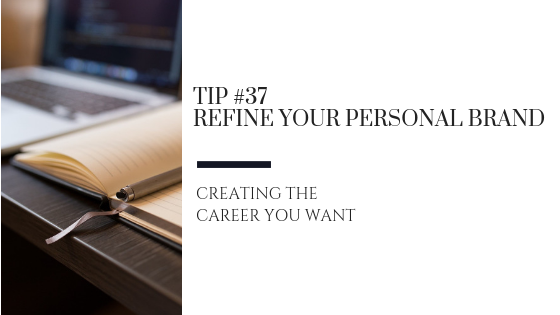 Once you have a clear picture of what you want to be known for, communicate and live your personal brand to create the career you want.